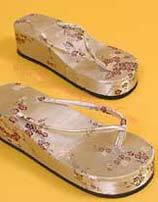 Platform Thong Sandals in Thai Silk. These flip flop sandals feature platform heels. 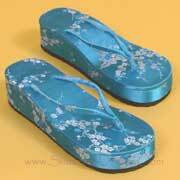 Please scroll down to see our collection of silk thongs ( also called flip flops) from Asia. We think you are going to love these cool thong sandals. They feature a funky looking "platform" sole that is sloped from back to front. 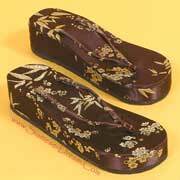 They are 1.25 inches high at the toe and a little over 2 inches high at the heel! 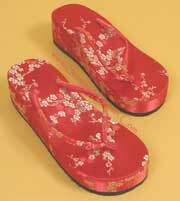 Plus they are covered with Thai silk with a beautifully embroidered floar design. The bottom of the thong has a rubber base that is over a quarter inch thick to help with durability. We have many customers who tell us they are ADDICTED to these thongs and love all the compliments they get. They have found them to be both comfortable and versatile; you can wear them to parties, to the beach, at the pool, or any time you want a comfortable shoe that looks good. They normally sell for $35 per pair so you are getting quite a discount. 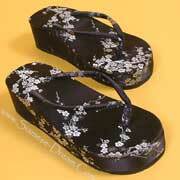 Please scroll down to see our selection of available colors for these thong sandals.